Welcome to the Typosphere: "When Hell freezes over"
If you'd like to have the Woodstock font, you can download it here. Thanks, Jeff, and keep on typing! That's great! love the passion. Holy cow, Jeff is an intense young man! Keep fighting the good fight brother, and never lose that passion! Just curious, any idea why he made the font prior to cleaning the typebars? "Just curious, any idea why he made the font prior to cleaning the typebars?" I'm sure Richard Polt also wonders about that; I didn't think of cleaning the typebars at the time. I don't know why I didn't think of it though. I guess I forgot about it, and just did it later on. Or maybe it was the nestalgia of using the still, grungy types to actually make the font, where-as the clean font would still look like a computer a bit. And to A.R.M.S. and Michaeliany, thanks for the encouragement. A.R.M.S. I read your Remington Rand Noiseless's story, it seems a lot like that of my Woodstock, in ways. It apperantly was found sitting in an old building someone was selling after their grandpa I believe it was, died. And a lot of other typewriters there as well. I have a November, 1923, ivory colored little Remington Portable #1, that I practically love. 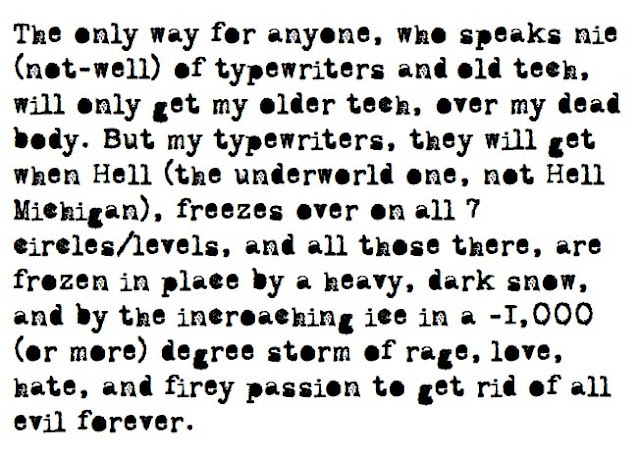 I hate to even say, that some of my typewriters, I haven't used in a while. Some I keep though they're unfixable for some reasons that I can't remember. I'm still trying to figure out how the heck to join the typosphere, but, I will jpin sometime here; hopefully soon. I wonder if I should post the story of how I got my typewriter. I already typed it, and just as your's apperantly, I typed it as the typewriter would have seen it. It's really differant for me, as I'd never typed anything like it before, but still. I think the font looks so much grittier, so more real, without having the typeslugs. I commend you, Jeff. You have a passion. Please stick to it, and join us here in the typosphere as soon as you can! 1914:thanks for reading my story! I just read the story of your Woodstock, and I thought it was wonderful. I'm glad it made its way to the Typosphere, and the Woodstock to someone who loves it. We hope you join soon! And you have an open invitation to join the ICI as well. Also, I agree with Ken; with the typeslugs cleaned, it almost would have been another fanciful computer font. But with them the way they were, it certainly gives the feel of having come from a typewriter. Great post. Sorry I missed it the day it was posted. It would be nice to have a large poster size flag. I like the Hell, MI reference too. Neat place. Ken, A.R.M.S., I'm not sure exactly how to "join" the typosphere, unless makign a typewriting blog counts, (which I'm thinking of doing), and Bill, Ken, and A.R.M.S., thanks for your comments.